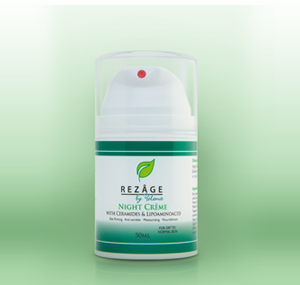 Our night crème has been known for nourishing severe cases of dry skin, like dermatitis and eczema, without any clogging. After a long day, cleanse your face and then apply our night crème before heading off to bed for a restful night of beauty sleep. Wake up with silky smooth, radiant skin—a perfect way to start off the day! This formulation utilizes skin care actives assembled as sub-micron spheres in a highly moisturizing extra-mild base for most effective delivery and prolonged release in the skin. Dipalmitoyl Hydroxyproline: s (Lipo-aminoacid, anti-aging, firming, moisturizing) Long-lasting firming & moisturizing effects, powerful anti-wrinkle action by stimulating contraction of collagen fibers, inhibition of age promoting enzymes, inhibition of free radicals, maintains integrity of the skin barrier, penetrates deeply into skin.